BUENOS AIRES — An Argentine military submarine has been found deep in the Atlantic Ocean almost a year to the day after it disappeared with 44 crew members aboard, the Argentine Navy said early Saturday. The submarine, the San Juan, was located almost 2,600 feet below the ocean’s surface by a private company that the government hired after an international search failed to find the vessel, which disappeared on Nov. 15, 2017. “Based on the state of the submarine, we will have to determine what happened,” he said. The submarine disappeared during a routine trip from Ushuaia in the Patagonia region to Mar del Plata in Buenos Aires Province. Eight days later — in the midst of recovery operations that covered 186,000 square miles — the navy announced that an explosion had been recorded near the submarine’s last known location, just hours after its final communication with the military. The explosion came to light only after analysts from the United States government and an international nuclear weapons monitor detected it and notified the Argentines. Vessels from Brazil, Britain, Chile, Russia and the United States, among others, combed the seas as part of the search. Daniel Esteban Polo, 56, whose 32-year-old son Daniel Alejandro Polo had been aboard the San Juan, said early Saturday that he was on his way to join other relatives of the missing sailors. “I’m going to Mar del Plata to be with my wife and everyone else,” said Mr. Polo, who lives in the suburbs of Argentina’s capital. 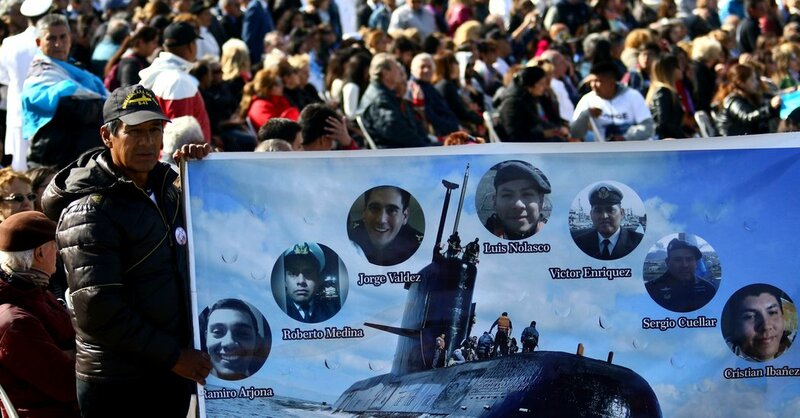 Over the past year, the naval base in Mar del Plata has become a gathering point for relatives of the crew, waiting for news about their loved ones. Just two days ago, family members and others gathered there to commemorate the first anniversary of the submarine’s disappearance. At that ceremony Thursday, President Mauricio Macri promised the families that the search would continue until the San Juan was found. “I want to tell you that we won’t abandon you,” he said. It was unclear on Saturday whether the military would be able to bring the San Juan to the surface. If not, Mr. Ramallo said, the navy may be able to use images to analyze the vessel for answers about its disappearance. “We have to see whether it is whole or whether it is split, and from there we can carry out the necessary analysis,” Mr. Ramallo said. The loss of the San Juan led to a shake-up in the navy, including the dismissal of its top commander, Admiral Marcelo Eduardo Srur. Defense Minister Oscar Aguad has remained in his post. The submarine’s disappearance is being investigated both by the courts and by Congress. The San Juan was located about 250 nautical miles from the port of Comodoro Rivadavia in Chubut Province, according to local news reports. It was found by Ocean Infinity, a Houston-based company known for its work trying to locate Malaysia Airlines Flight 370, which disappeared over the Indian Ocean in 2014. Argentina’s government signed a contract with the company in August that guaranteed it $ 7.5 million if it found the submarine. The contract was signed after many of the crew members’ relatives accused the government of abandoning the search. Dozens of them set up a makeshift camp outside the presidential palace in Buenos Aires for 52 days, demanding that a private company be hired to look for the submarine. Ocean Infinity began its search on Sept. 7, using a Norwegian-flagged vessel, the Seabed Constructor. Three naval officers and four relatives of crew members accompanied Ocean Infinity personnel aboard the ship. The search involved “technology never before used during the localization of a submarine,” the navy said at the time. It said the company would deploy autonomous underwater vehicles that could function to a depth of almost 20,000 feet. The mystery surrounding the fate of the San Juan, a German-made submarine that has been part of Argentina’s fleet since 1985, transfixed the nation.